Perform "Inspection After Repair" after replacing the camshaft, No. 2 camshaft, camshaft timing gear assembly, camshaft timing exhaust gear assembly or cylinder head sub-assembly (See page ). (a) Clean the cylinder block and cylinder head sub-assembly with solvent. 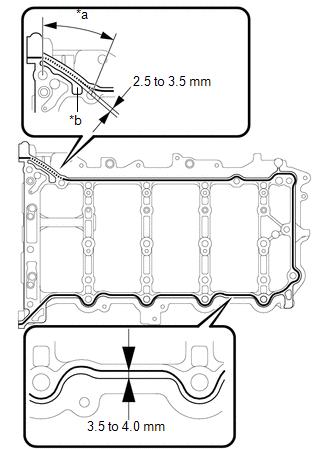 (b) Apply a continuous line of seal packing to a new cylinder head gasket as shown in the illustration. Apply at least 20 mm (0.787 in.) of seal packing from the inside edge of the protrusion of the cylinder block. Install the cylinder head gasket within 3 minutes and tighten the bolts within 15 minutes of applying seal packing. 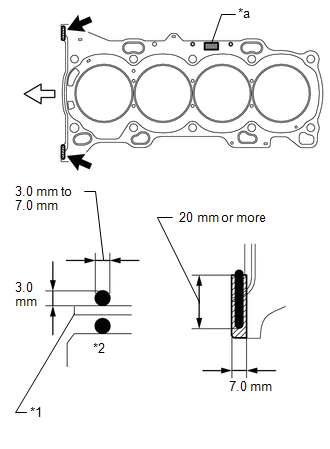 (c) Place a new cylinder head gasket on the cylinder block surface with the Lot No. stamp facing upward. The cylinder head bolts are tightened in 4 progressive steps. (a) Place the cylinder head sub-assembly on the cylinder block. Ensure that no oil is on the mounting surface of the cylinder head sub-assembly. Place the cylinder head sub-assembly on the cylinder block gently in order not to damage the gasket with the bottom part of the head. (c) Apply a light coat of engine oil to the threads and under the heads of the cylinder head bolts. 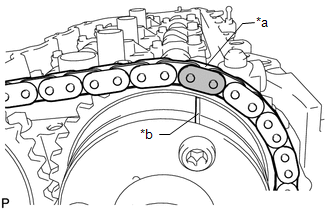 (1) Using a 10 mm bi-hexagon wrench, install and uniformly tighten the 10 cylinder head bolts in several steps, in the sequence shown in the illustration. Do not drop the plate washers for the cylinder head bolts into the cylinder head sub-assembly. 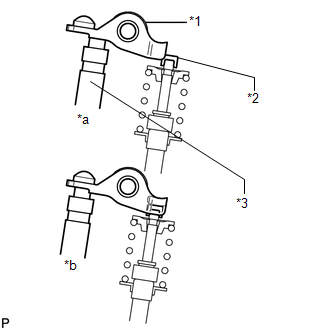 (1) Tighten the cylinder head bolts again in the sequence shown in the illustration to make sure that they are tightened to the specified torque. 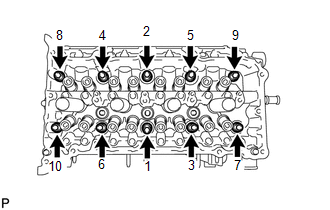 (1) Mark each cylinder head bolt head with paint as shown in the illustration. 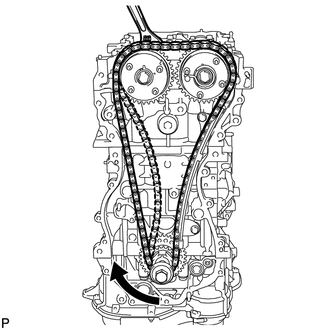 (2) Tighten the cylinder head bolts 90° in the sequence shown in step 1. (1) Tighten the cylinder head bolts another 90° in the sequence shown in step 1. (2) Check that the painted marks are now facing rearward. After the installation, if the seal packing has seeped out, wipe it off. 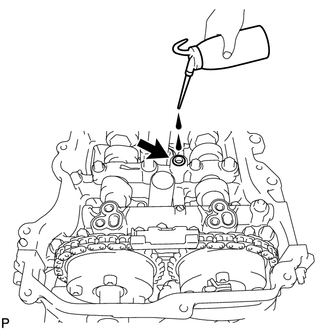 (a) Apply a light coat of engine oil to the valve stem ends. (b) Install the 16 valve stem caps to the cylinder head sub-assembly. 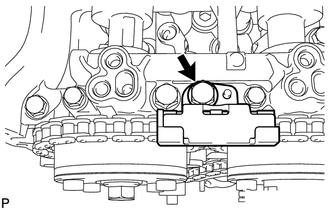 Do not drop the valve stem caps into the cylinder head sub-assembly. When installing the camshaft timing gear assembly, release the lock pin and set the camshaft timing gear assembly to the advanced position before installation. 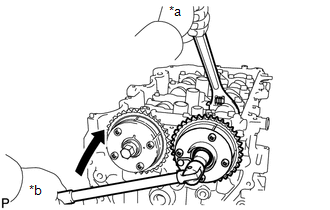 (a) Check the camshaft timing gear assembly position. 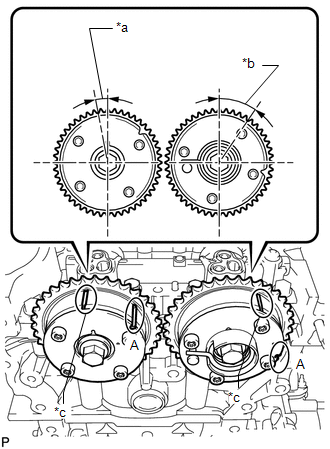 If the camshaft timing gear assembly is set to the advanced position, do not let the camshaft timing gear assembly rotate clockwise during installation. 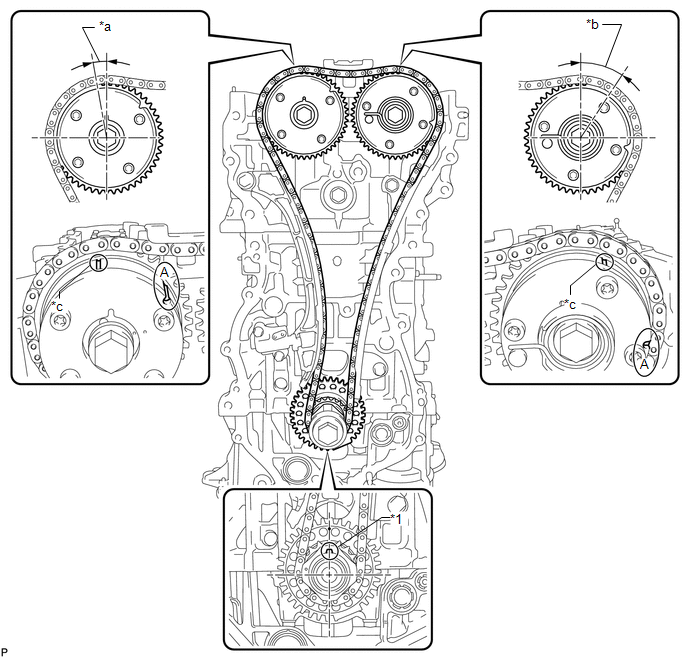 If the camshaft timing gear assembly rotates to the retarded position, release the lock pin and set the camshaft timing gear assembly to the advanced position. (b) Align and attach the knock pin of the No. 1 camshaft with the pin hole of the camshaft timing gear assembly. (c) Check that there is no clearance between the camshaft timing gear assembly and camshaft flange. (d) Secure the camshaft in place by hand, and then install the installation bolt of the camshaft timing gear assembly by hand. 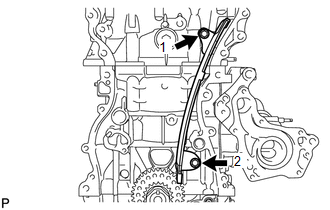 (2) Cover the 4 oil paths of the camshaft journal with vinyl tape as shown in the illustration. There are 4 oil paths in the grooves of the camshaft. Plug 3 of the paths with rubber pieces. (3) Open a hole at port (A) shown in the illustration. Cover the path with a piece of cloth when applying pressure to keep oil from spraying. 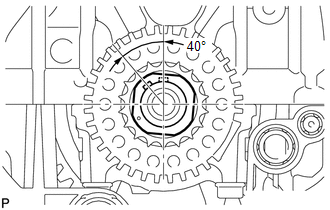 Depending on the air pressure applied, the camshaft timing gear assembly may be turned in the advance direction without applying any force. (5) Remove the vinyl tape and rubber pieces from the camshaft. (f) Remove the bolt and camshaft timing gear assembly. 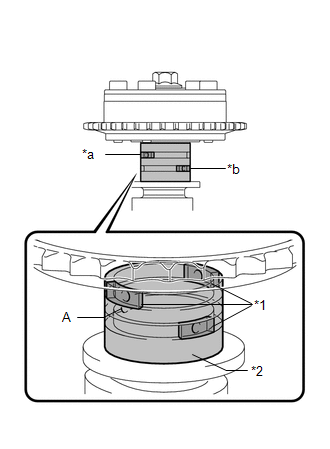 (a) Inspect the valve lash adjuster assemblies before installing them (See page ). (b) Install the 16 valve lash adjuster assemblies to the cylinder head sub-assembly. Install each valve lash adjuster assembly to the same place it was removed from. (a) Apply engine oil to the valve lash adjuster assembly tips and valve stem caps. (b) Install the 16 No. 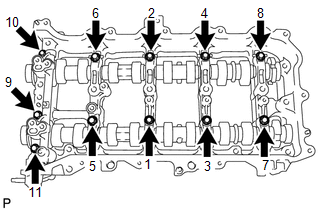 1 valve rocker arm sub-assemblies as shown in the illustration. (a) Clean the camshaft journals, camshaft housing sub-assembly and camshaft bearing caps. (b) Apply a light coat of engine oil to the camshaft journal, camshaft housing sub-assembly and camshaft bearing caps. (c) Install the No. 1 camshaft and No. 2 camshaft to the camshaft housing sub-assembly. Perform "Inspection After Repair" after replacing the No. 1 camshaft or No. 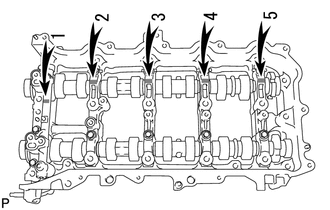 2 camshaft (See page ). 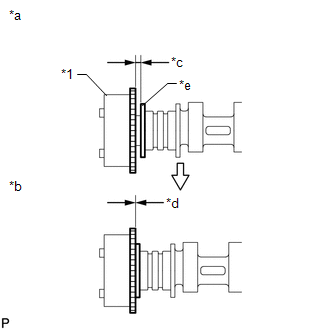 (b) Install the 11 bolts in the order shown in the illustration. Make sure that the camshaft rotates smoothly after installing the camshaft bearing caps. 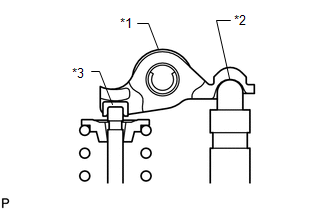 (a) Check that the valve rocker arms are installed as shown in the illustration. Install the camshaft housing sub-assembly within 3 minutes and tighten the bolts within 10 minutes of applying seal packing. (c) Position the knock pin of the No. 1 camshaft and No. 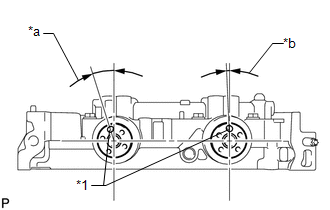 2 camshaft as shown in the illustration. 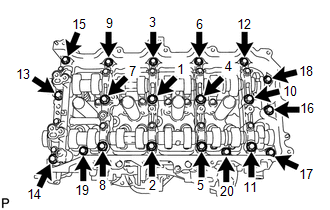 (d) Install the camshaft housing sub-assembly, and then install the 20 bolts in the order shown in the illustration. Thoroughly wipe clean any seal packing. If the camshaft timing gear assembly is not set to the advanced position, release the lock pin and reset the camshaft timing gear assembly (Refer to the "Set Camshaft Timing Gear Assembly" procedure). (d) Using a wrench to hold the hexagonal portion of the No. 1 camshaft, install the bolt. Be careful not to damage the cylinder head sub-assembly or spark plug tube with the wrench. 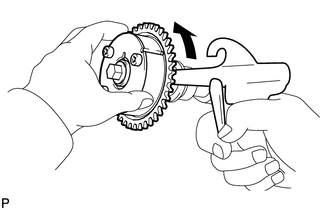 Do not disassemble the camshaft timing gear assembly. (c) Using a wrench to hold the hexagonal portion of the No. 2 camshaft, install the bolt. Do not disassemble the camshaft timing exhaust gear assembly. (a) Add 50 cc (3.1 cu. 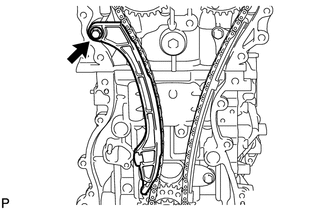 in) of engine oil into the oil hole shown in the illustration. Oil must be added if the valve lash adjuster assemblies were removed. Make sure that the low pressure chamber and oil paths of the valve lash adjuster assemblies are full of engine oil. 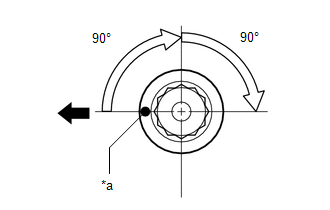 (b) Rotate the crankshaft 40° counterclockwise to position the crankshaft pulley key as shown in the illustration. 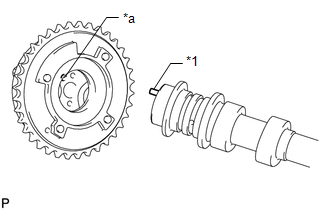 (c) Check that the timing marks of the camshaft timing gear assembly and camshaft timing exhaust gear assembly are as shown in the illustration. (a) Install the No. 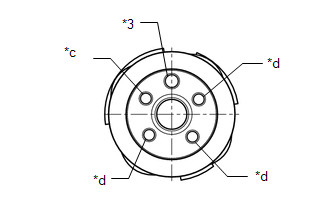 1 chain vibration damper with the 2 bolts in the order shown in the illustration. 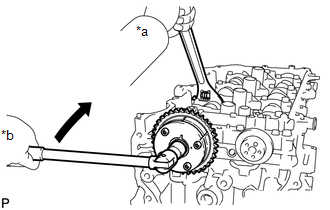 (a) Place the chain sub-assembly onto the camshaft timing gear assembly, camshaft timing exhaust gear assembly and crankshaft timing sprocket. Make sure the mark plate of the chain sub-assembly faces away from the engine. It is not necessary to install the chain sub-assembly to the teeth of the camshaft timing gear assembly, camshaft timing exhaust gear assembly and crankshaft timing sprocket. 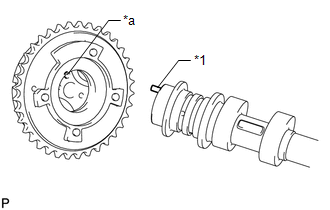 (b) Align the mark plate (yellow or gold) of the chain sub-assembly with the timing mark of the camshaft timing exhaust gear assembly and install the chain sub-assembly to the camshaft timing exhaust gear assembly. 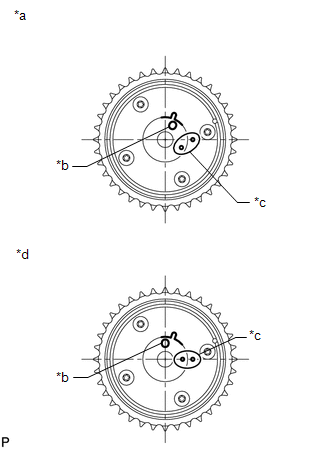 (c) Align the mark plate (pink or gold) of the chain sub-assembly with the timing mark of the crankshaft timing sprocket and install the chain sub-assembly to the crankshaft timing sprocket. 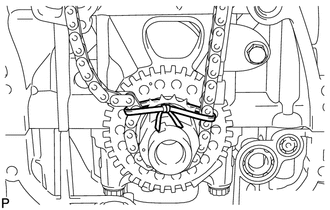 (d) Tie a string above the crankshaft timing sprocket to secure the chain sub-assembly. (e) Using the hexagonal portion of the No. 1 camshaft, rotate the No. 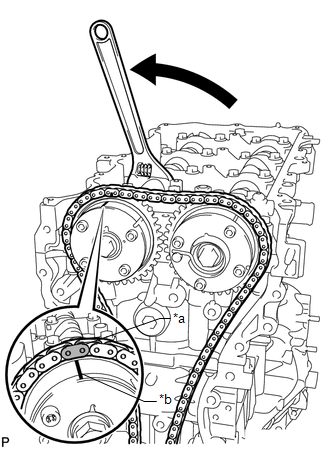 1 camshaft counterclockwise with a wrench, align the timing mark of the camshaft timing gear assembly with the mark plate (yellow or gold) of the chain sub-assembly and install the chain sub-assembly to the camshaft timing gear assembly. Hold the No. 1 camshaft in place with a wrench until the No. 1 chain tensioner assembly is installed. 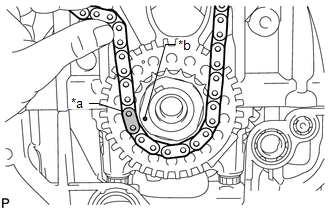 (f) Remove the string above the crankshaft timing sprocket, rotate the crankshaft clockwise, and loosen the chain sub-assembly so that the chain tensioner slipper can be installed. Make sure the chain sub-assembly is secure. (a) Install the chain tensioner slipper with the bolt. (a) Install a new gasket and the No. 1 chain tensioner assembly with the 2 bolts. (b) Remove the pin from the stopper plate. 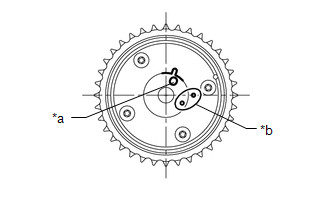 (b) Rotate the crankshaft clockwise and align the crankshaft pulley set key as shown in the illustration. 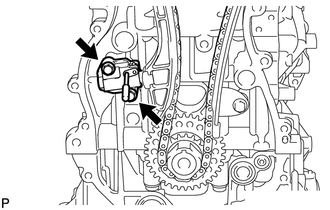 (c) Check that the timing marks on the camshaft timing gear assembly and camshaft timing exhaust gear assembly are as shown in the illustration. (d) Remove the crankshaft pulley bolt. (a) Install the exhaust manifold converter sub-assembly (See page ). (a) Install the engine assembly with transaxle (See page ).